ST Foundation and the NGO MLFM (Movimento per la Lotta contro la Fame nel Mondo), together with METID –Polytechnic of Milan partnered in 2006 in order to launch a project aimed at fighting the digital divide in Uganda. 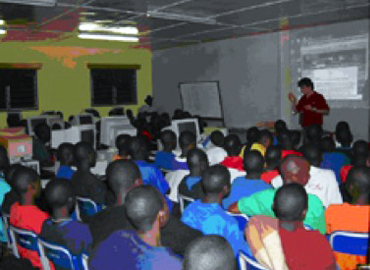 Through this initiative, a number of goals were met: a Wi-fi network was created at BCKSS (Bishop Cipriano Kihangire Secondary School) in Luzira, in order to allow students and teachers to communicate and share knowledge inside the school through the net; internet offices and laboratory classrooms were linked; internet connection was distributed to the School Hospital in order to allow better administration and telemedicine applications; teachers were trained, so that they could profit from such benefits during didactical activities. DU training in Uganda benefited 1600 trainees since its inception. The program ended in the first quarter of 2010.